Junya Watanabe’s menswear show at Paris Fashion Week in January will conclude my coverage of the Fall 2017 menswear season as we gear up to embark on the Spring 2018 expedition (more on that tomorrow). The Japanese designer is one of the last to show on the calendar, generally on the third last day of fashion month. The advantage, perhaps, of displaying one’s latest work in the season’s denouement is that there is ample opportunity for the freshness of the show to dominate season-end coverage. One could say, deservedly, Watanabe placed highly in the coverage articles. Firstly, there were the clothes. There was no elaborate spectacle. A traditional runway with functional, stereotypically masculine clothes concerned with an outdoors theme. The Watanabe man had a vagabond spirit. Dressed in heavy-duty outerwear, coats accented with fur collars or purposeful pockets, the sturdiness and robustness of the outfits symbolised a certain resourcefulness—a backpacker psyche. There was a pervasive warmth that defied Watanabe’s usual loftiness; comfort, warmth were his priorities—it was welcome, complemented by the morning sunlight which filled some of the show space. Interestingly, the show marked a partnership between Watanabe and The North Face, the American outdoor product company. There was a grey plaid jacket that opened the show, with a contrasting canary panel on the chest. It points to a trend recently analysed by Jason Chen in New York Magazine, called “First Came Normcore. Now Get Ready for Gorpcore”. Gorpcore is defined by internet-terminology lexicon Urban Dictionary as “fashion design that is influenced by outdoors style, such as fleece jackets, fanny packs, windbreakers, puffy jackets and hiking boots.” It’s quite ironic this new trend: North Face jackets generally cost between €100 to €200. The one’s in this collection will retail, surely, for upwards of threefold and they’ll be manufactured the same way as the North Face ones, but collaborations signify an inordinate shift in demand vs supply. (Watanabe wasn’t the only Japanese designer to associate with the brand, Chitose Abe’s Sacai show also featured The North Face.) There were also tie-ins with Barbour, Carhartt, Levi’s and Van’s. Furthermore, having had the tactile experience of being in Watanabe’s clothing’s presence in the London branch of Dover Street Market, I will commend his fabrication and silhouetting. I would, admittedly, love one of the North Face jackets in this collection. However, strikingly, I am beyond a state of bafflement as to his heinous casting—an undisputed, ongoing issue. White man after white man, the models emerged. How is this a positively influencing the world? How is this considered acceptable? If anything, casting is a reminder of how creatives reflect their world in their clothes. 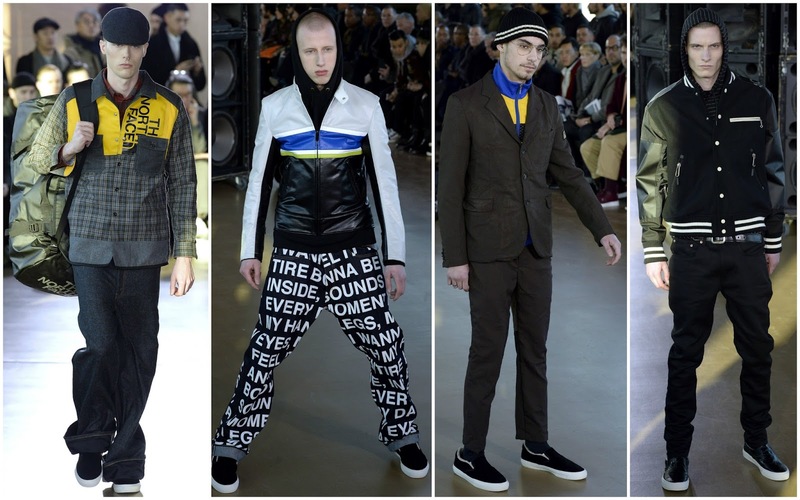 Something tells me Junya Watanabe’s world isn’t white. Diversification of his runway is essential, especially considering his status as one of the most revered in the industry. I’m not saying Watanabe is the worst offender, but he’s a repeat offender and an offender nonetheless. Something has to be done to resolve this. Otherwise his clothes, strong clothes, will fall to the wayside because of an easily reparable matter. I agree completely regarding the models and the way that these designers may choose to portray how the world is. Loved the article.